Michael Agerskov - Poet and Humanetarian. Kaj Michael Andreas Agerskov’s name will forever be inextricably linked to the great religious, ethical and scientific work, Toward the Light!, for which he stood as the publisher in 1920. Agerskov himself was not the author of the work – it had been received by means of intuitive inspirational thought influence from the extrasensory world by his wife, the medium Johanne Agerskov, née Malling-Hansen. However, the publication would never have been possible without the participation of Michael Agerskov – his importance as assistant and supporter of his wife’s work as a medium can hardly be overestimated. Their personalities supplemented each other and their work will forever stand as a shining example of the strength inherent in a harmonious cooperation between man and woman when they constitute an unbreakable synthesis. Johanne contributed with her very well-developed ability to “hear” the speech of the spirits, and Michael with his unshakable faith in his wife’s capabilities and in the truth of the messages she received. Untiring in their efforts for the cause of the Light on earth: Johanne, 1873-1946, and Michael Agerskov, 1870-1933. The picture is probably taken short time before they married in 1899. Photo: Private. It was precisely this cooperation which made it possible for the Light to actually emerge victoriously from the fight against Darkness in the spiritual world, since Michael and Johanne Agerskov, with profound confidence in Christ, had taken pity on the very being mankind had been fearing for millennia – he that through his evil plans had been responsible for evil in the world and all the horrible sufferings of mankind. In March 1912 Christ led him in a state of invisibility to Johanne and Michael Agerskov’s home. In the spheres, before the “Fall of Man”, he was one of the foremost leading figures in the service of the Light, but at a decisive crossroad he allowed pride and complacence to sneak imperceptibly into his mind and wanted to become “God”, unaware that in so doing he made himself into a helpless slave of Darkness. Broken down by torment and remorse he – the devil – begged by means of his thoughts Michael and Johanne Agerskov for forgiveness for all the evil he had done against them and against mankind, and Michael and Johanne Agerskov forgave him out of the compassion of their hearts and prayed a heartfelt prayer to God for his salvation! In that very same instant Darkness forever lost its power over his divine will and thought, and even if Darkness still has a great power over humans, Darkness has become without willpower, and it is only a matter of time before brighter times will also come on earth! Even if Toward the Light! is not yet known among the great majority of people, sooner or later the work will become a joint foundation around which all mankind can gather. For even if God’s millstone grinds slowly, his plans will sooner or later always become reality. How long time it will take before Toward the Light! has become known by the great majority of people nobody knows, not even God. Perhaps it will take 10 years – perhaps 100. What is absolutely certain is that Michael and Johanne Agerskov’s names will forever be written in golden writing in the sky! Admittedly, their work has not yet produced the greatest fruits, but through their sacrificing and confident effort it has now become possible to tell everybody the truth about the origin of man and about the struggle between Light and Darkness. Toward the Light! is there like a gold mine, waiting to reveal its grains of gold for everyone seeking God’s truth! Hence, Toward the Light! became Michael Agerskov’s great mission and the work of his lifetime. But in addition to this he worked as a lecturer, external examiner and textbook writer and he was also a fiction writer. Michael Agerskov had, together with his wife, Johanne Agerskov, been incarnated with the purpose of assisting Christ and his helpers to carry into effect the “shorter cut” – the direct contact between the spirits of the Light and the humans. Thanks to the Agerskov couple’s confidence in the spirits of the Light all the earthbound spirits, including Ardor, were successfully won back into the Light, and God was able to erase the sphere of hell. Then followed the arduous work of receiving the story about the origin of the fight between Light and Darkness, the creation of man, and about the true relationship between God and the humans. Photo 1 and 3 : The Royal Library. Photo 2: Private. Unfortunately, there are rather few descriptions of Michael Agerskov from people who met him in the flesh. One of the exceptions is the journalist Christian Houmark, who interviewed Johanne and Michael for Berlingske Tidende in October 1923 in connection with the publication of Agerskov’s book “Some Psychic Experiences”. Houmark refers to Michael Agerskov as a “respected educationalist and scientist”, and he mentions that “Mr Agerskov’s previous books: “Toward the Light” and “Greeting to Denmark” provided him with quite a large and interested circle of readers also outside the milieu of supporters of psychic research. In summary, he is a personality with a profound educational and cultural background, and his knowledge appears to be firmly established as well as comprehensive. There is no hysteria, rather everything bears the impress of seriousness and an almost ponderous truthfulness. In other words, Michael Agerskov appears to have been a very much respected and highly educated man with a confidence-inspiring personality, characterized by his truthfulness and his respectful treatment of the issues referred to in the books for which he was the responsible publisher. Descendents of the Agerskov family also relate that Michael Agerskov was an unusually kind-hearted person, characterized by a very sincere friendly attitude and great consideration for other people! Neither he nor his wife ever had any need to boast about themselves or assert their own efforts, - on the contrary they always presented with humility and respectfulness the truths they had conveyed through Toward the Light! And there was never any attempt to assume for themselves any honor for the messages conveyed – they always underlined that they had merely written down and conveyed the content word by word – and that the content stemmed from the spirits of the Light! From Toward the Light! 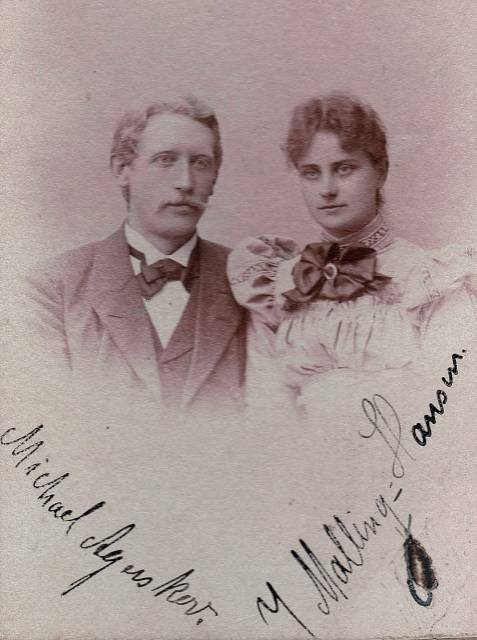 we know that Michael and Johanne Agerskov had been incarnated with the particular purpose to assist Christ and his circle who from the mid-19th century, as discarnated beings, were seeking earthly assistants in order to achieve what God called the “shorter cut”, or “genvejen” in Danish language. For this mission God needed people of a very particular mold, able to believe that dead people can contact earthly humans, and with sufficient personal strength, integrity and honesty to not succumb to the temptation of using their experiences for their own benefit. And in Michael and Johanne Agerskov the spirits of the Light found exactly the qualities they needed from their earthly assistants, and God’s plan to win Ardor and the earthbound spirits back to the Light succeeded in fully. 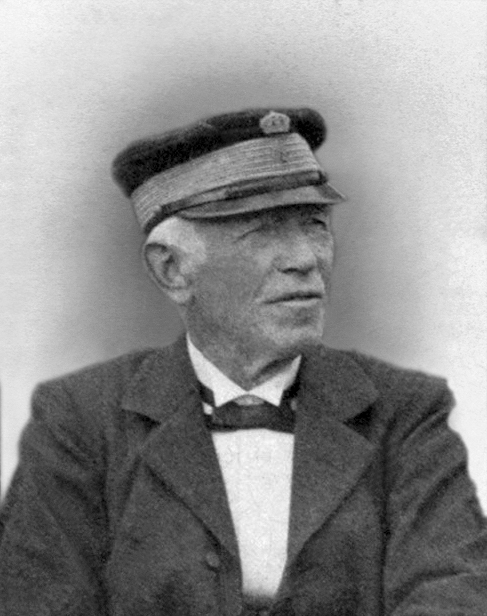 Michael Agerskov’s father, customs inspector in Nykøbing Sjælland, Henrik Frederik Agerskov, 1824-1902. As a young man he wanted to become a naval officer and he participated, among other events, in the battle of Helgoland on May 9, 1864 against Prussian canon boats on board the frigate Jylland. However he had to abandon the naval officer career because of a serious of typhus. According to the family Agerskov was “extremely kind, very social, entertaining and something of an “aesthete”, a true civil servant as they were at the time.” Photo from 1861 from the Royal Library. 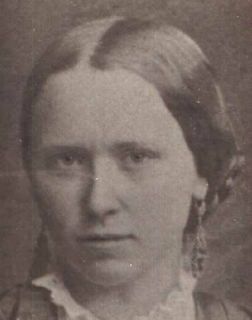 Michael Agerskov’s mother, Andrea Louise, née Stephensen, 1835-1908. 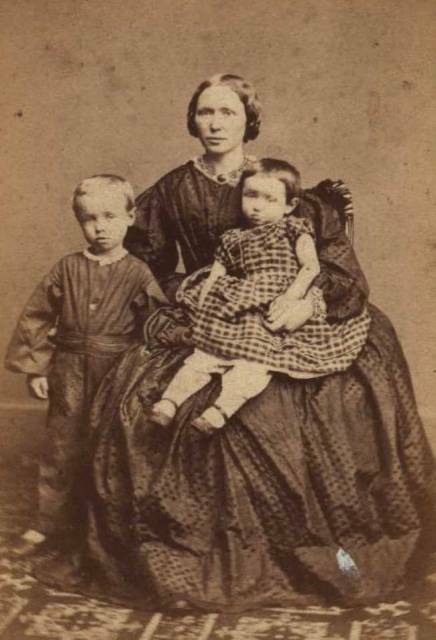 In the photo we see her with her two eldest children, Christian born 1859 and Henriette born 1862. Her father was a priest, and the maternal family, the large Grove family, can trace their ancestry all the way back to the 14th century, and they are well-known for the many naval officers in the Danish fleet. Andrea Louise is said to have been a very energetic woman with plenty of enterprise! Photo: Private. For those who know about how the unconscious, astral attributes are inherited generation by generation it is immensely interesting to study the past history of the Agerskov family, because it was full of very fascinating and talented people, very much leaving their mark on their age and contemporaries. And it is very easy to recognize the characteristics so prominent in Michael Agerskov in several of his forefathers. It is probably no exaggeration to assert that the strength of character and honesty characterizing Michael Agerskov had been built up as an astral family heritage through many generations. From Toward the Light! we know about how the youngest would frequently incarnate in several generations following each other in the same family in order to establish a family heritage where different talents and qualities were very prominent, such that the brilliant abilities of the youngest would have the best possible conditions to develop. The instinctive part of our personality is a highly effective part of our consciousness, and according to Toward the Light! personal development can be regarded as a method to ennoble it in such a way that we leave to our descendents an inheritance of cultivated personal abilities and talents. In the Agerskov family it is believed that the family has its origin from the small community by the name of Agerskov in the extreme south of Jylland. However, also in the Viborg area in Jylland there is a place by the same name, and so far nothing I certain about the origin of the family. What we know is that Michael’s ancestors can be traced back to the beginning of the 18th century, and the population census of 1787 documents a person by the name of Chrestian Agerskou, 72 years old, single, royal advisor and delegate of what at the time corresponded to the Ministry of finance, and he was the household head of a large family in the Vester residential quarter, Nye Kongens gade 326. His very successful career is recorded in the first edition of Danish Biographical Lexicon, and the biographical article about him ends thus: “He died on the 2nd of December 1789, recognized as a particularly zealous, honest and skilled official”. Hence, in the very first known person of the Agerskov-family we find exactly the same qualities as those characterizing Michael Agerskov: Probity and competence. And already at this point in time we can see that the Agerskov-family had built up a strong position in the Danish society. That they must have been rather affluent we can deduce from the number of service staff members in the household, for they had as many as 7: Waiter, coachman, farm hand, housekeeper, lady’s maid, parlor maid and cook. The master of the house was single, but his brother’s children were staying with him and one of them was also named Chrestian Agerskou, 34 years old, single, and at the time a secretary in the customs department. Later he was promoted to be the very first Chief Customs Inspector in Copenhagen, and he was Michael Agerskov’s paternal grandfather. Unfortunately it has been very difficult to unearth any sources of information about Chief Inspector of Customs and Councillor of State Agerskov. What we do know is that he married relatively late the widow after his colleague Henrich Haas, 1777-1817, Johanne Christine Christensen, 1784-1859 (In some sources we find her name written as Hanne Christine). 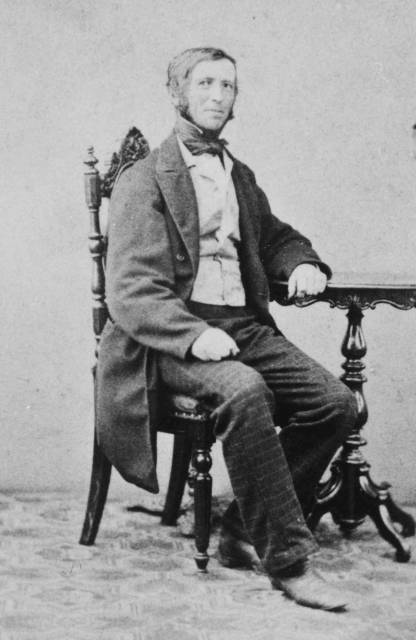 She had by then already given birth to four children, but Christian Agerskov adopted these, and the couple had only one son together, in 1824 – Henrik Frederik Michael Agerskov, Michael Agerskov’s father. Christian Agerskov was buried in the Vor Frue Church in Copenhagen, and in an old document in the possession of the family the following was noted: In the Church of Vor Frue: A sandstone pillar with a white marble plate on which can be read: Here lies the dust of the loyal husband and father, Official in the Department of War and Royal Customs Inspector Heinrich Haas, born August 21, 1771, died March 17, 1817. The mortal remains of Inger C. Christensen born Hansen, died December 24 1825, 76 years old. At their side is the dust of Christian Agerskov, State Councillor and Chief Customs Inspector in Copenhagen, born January 3, 1753, died May 20, 1832. For more than half a century he served his King and his country loyally and honestly. A dear wife, 5 children and 2 sisters mourn him as their faithful friend and supporter. – Above the monument is a white marble vase. Unfortunately we don’t know much more about Chief Customs Inspector and Councillor Christian A. Agerskov than what has been related above. Hopefully future research will be able to uncover more detailed information about him. Heinrich Haas died in 1817, only 35 years old, and Johanne Christine married Haas’ almost 20 years older collegue, customs inspector and councilor Christian Agerskov, 1753 – 1832. Together they had the son Henrik Frederik Michael Agerskov, born 1824, and in 1825 Agerskov adopted Johanne Christine’s four children from her first marriage. In is quite interesting to note that Christian and Johanne Christine Agerskov in fact jointly decided to name their only son together after her first husband, Heinrich. It was a fine gesture, and I think this is very telling of Agerskov’s character. In the obituary over one of the adopted sons, professor Christian Agerskov in ‘Illustreret Tidende’, Chief Customs Inspector Christian Agerskov is referred to as a very rich man. 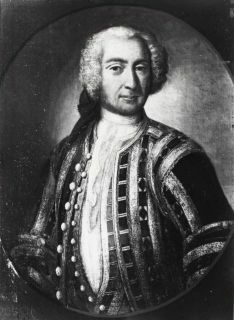 He probably inherited his uncle, Christian Pedersen Agerskov, 1714-1789, who was single and had made a brilliant career as a delegate of the Treasury in Copenhagen, and in addition it is not unreasonable to imagine that there was also some kind of assets involved when Agerskov “took over” Haas’ widow with four children. It was not unusual at the time for such a thing to happen. Three well-known ancestors of Michael Agerskov. 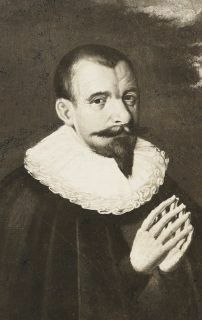 From the left Rasmus Æreboe, 1685-1744, Notarius Publicus in Copenhagen. In the middle Nicolai Jacob Jessen, 1718-1801, valet with Frederik V’s sword manufacturer, councilor and treasurer at the Øresund Custom House. To the right Jens Pedersen Grove, 1584-1639, initially clerk of the court, later local sheriff as well as lighthouse keeper in Helsingør. Copyright: The Royal Library. In the very first days of the year I have vivid recollections about all the kindness you have bestowed me during the past year. How could I therefore fail to convey to you my congratulations on this occasion. Above all I wish you, dear parents, an unspoiled good health in the new year, for this takes precedence as the pre-condition for enjoying life. Then I also wish that the ever-loving and all-merciful shall pour out the cornucopia of His salvation over you, granting you everything good in life and thereby provide you with a long life. Dearest father, loving mother, I hope also this year to receive your love and good will. I will strive to give you only joy. Your dearly loving Andrea Stephensen. While it has been difficult to trace Michael Agerskov’s family on the paternal side further back than until the 18th century, it is very different with his mother’s side. Several people have done research about this family line, and it can be documented for at least 15 generations, all the way back to the 14th century. Here we find, among others, two English nobles - the Knight of Berwick and Chillingham Thomas Grey, and the Duke of Norfolk, John Mowbray. Also the Lord of the manor in Bork, Niels Eriksen Gyldenstierne and his wife, Edel Saltensee of a well-known aristocratic family of that name, hailing from Sjælland, whose progenitor, Toke Nielsen, was married to the daughter’s daughter of the grandson of Skjalm Hvide. Jørgen Stephensen came from a well-off family of artisans, and the father ran a lucrative cooperage – in other words, he made and repaired barrils. But the father died in 1806, the mother in 1812, and the family assets were sold in an auction and fetched a sizeable sum of money, however rather soon dwindling since the coin called ‘daler’ just a couple of months later was devalued to 5/48 of its original value. Stephensen at that time had two years left of his academic studies and had little money to live by. At the time Stephensen graduated the Kieler peace broke out, and immediately there was great competition for the official jobs in Denmark, since it was no longer feasible to use Danes for official posts in Norway. “The revolt was a very special occurrence for the busy vicar and his 10 children, they were driven away and were absent from the parish for a year. When they were reinstated it was under jubilation from the local people, but this is a story in itself that Jørgen Stephensen himself has related in the parish register. Already in 1839 when Jørgen Stephensen had celebrated his 25 year anniversary as a vicar, the parishioners had honored him with a celebration in the largest hall in Broager and presented him with a magnificent Bible. However, the reception bestowed to the family at their return in 1849 was an even greater joy. When the dean of Sønderborg in 1851 requested permission to resign, Jørgen Stephensen was constituted as dean and carried out this calling until his death on the 9th of November 1856. The appointment itself came a few days before this date. There have been two dissonances found in his relationship with the congregation, one was in relation to a Moravian family he did not wish to recognize, and the other one was in the daily dealings with the parochial church council, in charge of the finances. They were stingy with the parochial funds whenever construction was needed in the church and in the vicarage; however today there are quite a few visible memories about Jørgen Stephensen’s work in Broager. The deaconry, the by now demolished poor-house, the windows until 1924/27 adorning the nave of the church and the design of the Broager town park, the vicarage garden transformed from a vegetable patch into English style gardens and already as from 1901 rented out by the municipality for a period of 99 years." 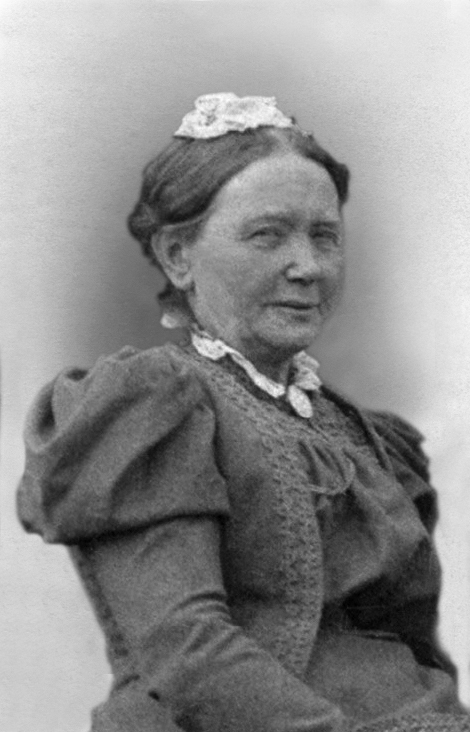 Jørgen Stephensen’s wife, Henriette Christiane Stephensen, survived her husband by more than 15 years. 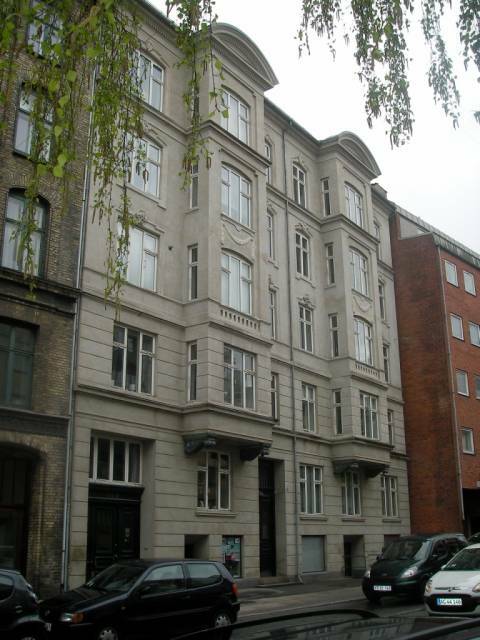 After his death she moved to Flensburg, where she died in her home at Mariegade in February 1872. We know little about Henriette’s personality, but it should be enough just to contemplate her portrait to see that this was a very warm and kind person. The couple had a total of 10 children together, of which number six was Andrea Louise, Michael Agerskov’s mother. 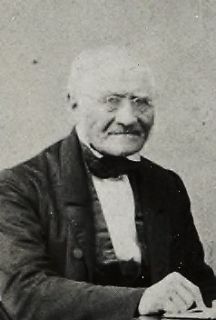 Michael Agerskov’s maternal grandfather, Jørgen Stephensen, 1791-1856, rural dean and rector in Broager. 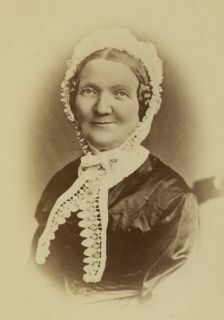 Michael Agerskov’s maternal grandmother, Henriette Christine, née Grove, 1801-1872. Photo: Private. Mr and Mrs Stephensen’s daughter, Michael Agerskov’s mother, Andrea Louise, 1835-1908, photographed in 1857. Photo: Private. The adolescent Michael Agerskov photographed with his siblings. From left: Henriette (Henny), born 1862, Anna, born 1873, Christian born 1859 and Michael born 1870.Photo: The Royal Library. 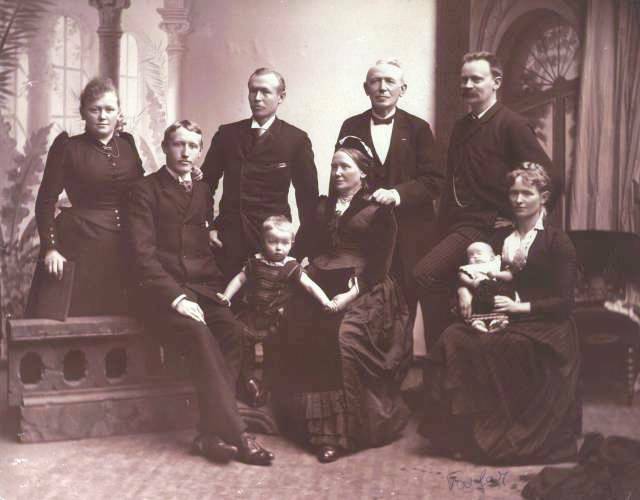 The Agerskov family, photographed in the beginning of the 1890s. 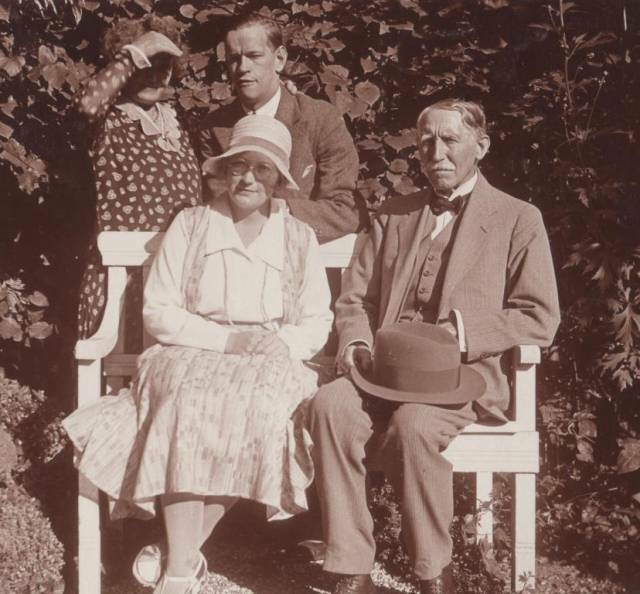 From left: Anna married name Lindahl, dentist (b.1873); Michael, writer and lecturer (1870-1933); Christian, engineer (1859-1928); sitting: Andrea Louise née Stephensen (1835-1908); Michael, inspector of customs (1824-1902); Halfdan Kongsted, lecturer (1857-1894); Henny, married name Kongsted (b.1857). 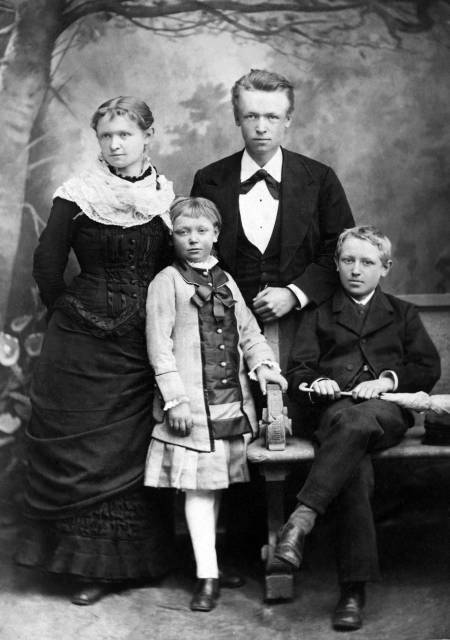 The two children are the daughter and the son of Henny and Halfdan Kongsted. Photo: Private. Michael Agerskov spent his earliest childhood in Rørvig, Sjælland, and in one of his novels, “The Great Gunpowder Conspiracy” from 1902 he has given a vivid description of life for a young Danish “boy” at the time. The novel has strong autobiographical traits and tells about exciting experiences with boats in a marine environment but also about how boys used to be punished harshly for their mischief in those days. Some letters written by young Michael when he was around 10 years old have also been preserved, and through these emerges the picture of a rather serious young man, very much conscious of his own fine talents. He also relates how he has planted bulbs and taken care of his flowers, and this cannot have been very common for a boy in Denmark in the 1880s – but it certainly indicates that he grew up in a well-heeled family, rich in resources of all kinds. 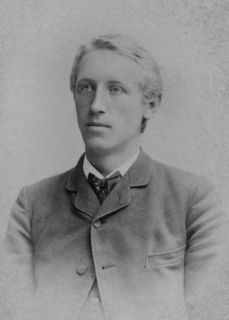 He had two elder siblings, Christian, born 1859, and Henriette (Henny), born in 1862, as well as a younger sister, Anna, born in 1873. Christian was a very able-minded man; he qualified to become an engineer and, among other things, was responsible for the enlargement of the new harbor in Copenhagen in the early 20th century and was portrayed in an article in “Illustreret Tidende”. He was also an inventor and came up with a fuse to be used in steam engines – called ‘Admonitor’- that he patented and sold all over the world. Henriette is the only one of the siblings with descendents living today. She was married to Halfdan Kongsted, secondary school teacher, who died from cancer already in 1894 and they had two children. Their son was married twice, had four sons in his first marriage and four daughters in his second, and he has left behind as of today (2010) more than 100 descendants. 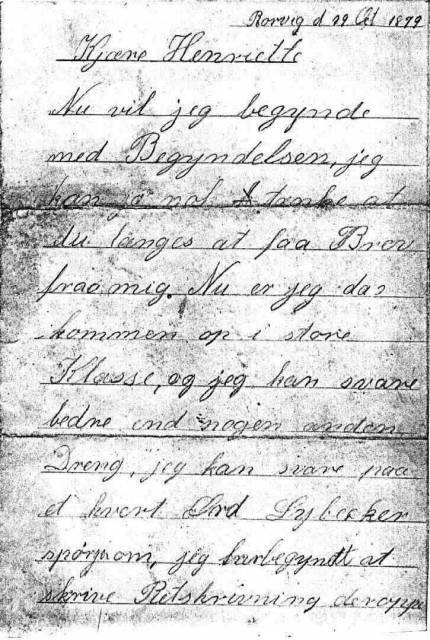 Letters between the various members of the family from Michael’s early years show clearly that the members of the Agerskov family had very close ties with each other, and the consideration and compassion with the eldest daughter when her husband died tragically in 1894 bear witness of the true feelings of affection and solicitude they had for each other. In this atmosphere of happy family life and robust home conditions Michael grew up, finding good nourishment for his young mind in the local environment and in encounters with mariners and yarns about the hard life at sea. Death and drowning at sea was probably present in his world from an early age, and we also find traces of that in his collections of poems, often dealing with the big issues in life such as death and love. Evidently Michael had an inclination for pondering life’s big questions, and he probably developed the seeds of a home-spun philosopher already from an early age. We do not know exactly when or in what context he first met Johanne who was to become his girlfriend and fiancée, but we can gain a good impression of the romantically inclined Michael from the novel “The Source of Life” from 1897, which also bears clear hallmarks of being inspired by his own love relationship to Johanne, and here it seems they met relatively early during the period of his studies, probably when Johanne was no older than 15-16 years. For the readers who wish to learn about Michael Agerskov’s youth and his first years with Johanne Agerskov I strongly recommend reading “The Great Gunpowder Conspiracy” as well as “The Source of Life”. Personally, I have also had much benefit and joy from Agerskov’s saga about Adathysda. With Adathysda from 1895 Michael Agerskov published his first novel, and it is a wonderful, quite small volume of only 96 pages. I have to admit that I am not familiar enough to be able to tell whether the name Adathysda bears any reference to mythological figures, but it does give associations to the great romantic tragedies such as Romeo and Juliet or Bendik and Årolilja. The theme of Adathysda is the greatest and always recurrent theme, namely love and the condition for love in our earthly life. Hence, Michael Agerskov did not embark on trifles in his writing. The story can be summarized quite easily since not much happens during the 96 pages of the book, and the plot develops quite slowly in a language with an abundance of imagery and a mythical, dreamlike character. The narrator himself calls the story a poem, and it is built up of 25 very short chapters or stanzas, each one 2-3 small pages. We learn that Adathysda was of a people who lived long time ago in a country named Urahan, and that she died from grief when her great love, the young Verleno was killed because her father could not accept their love. 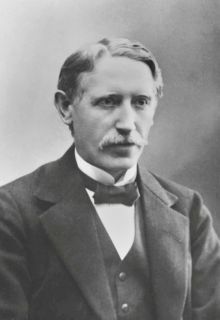 Michael Agerskov also published the collection of poems “Two People and Twilight” in 1893, “The Voices of Dusk” in 1899 and “From the Old Sailors’ Village and Other Poems” in 1909. Obviously, Michael was a keen observer, for many of the poems have excellent portraits and character sketches and evidently have had living prototypes. Young Michael’s thoughts must also have revolved around the uncertain life for sailors and their families and about those who disappeared on the sea and the feelings of the people left behind, and many of the poems are sad and tragic, even if there is also a dose of humor now and then. With his sensitive mind, undoubtedly Agerskov possessed a great deal of empathy for suffering people already as a young man, and as a backdrop in many of his poems is a great sense of sorrow about the lives full of human suffering that he writes about, and one senses that it is Agerskov’s spiritual knowledge, stemming from his discarnated condition, about the fall of the Eldest for Darkness and their tormented existence as the slaves of Darkness which shines through in his writing. Agerskov’s earliest collections of poems had a few respectable comments in the press, but he never got any really great public recognition, unfortunately. Personally I am among those who would like to see the poet Agerskov rescued from oblivion, for his body of work deserves it. His very special poetic voice would absolutely be able to bring joy to many more! His poems very much contribute to drawing the reader’s thoughts away from the superficial and inane and they provide inspiration for meditation and reflection! The lion’s part of Agerskov’s writing is from the period before the great work with Toward the Light and adjacent texts escalated, but the world the married couple was introduced to through cooperation with the extrasensory spirits naturally inspired the poet Agerskov and he published two collections of poems based on the ideas in Toward the Light, “The Way, the Truth and the Life”, spiritual songs from 1928 and a few years later “On the Mountain of Transfiguration” – a cycle of poems. For cognoscenti of Toward the Light! these poems are of course very significant and moving, but in my view Michael Agerskov has managed to add wisdom from his own poetic vein to the ideas of TtL, making the poems appear as worthy pieces of art in themselves, completely independently of Toward the Light! In “Some Psychic Experiences” from 1922, he told in his own words about his and his wife’s experiences as psychic researchers and about their cooperation with the extrasensory spirits. And he also published a small text of 44 pages entitled “The Church and Christianity” in 1923, also based upon TtL. Michael did his secondary school studies at the “Efterslægtsselskabet Skole”, and possibly his teacher in Danish literature was his uncle Christian Agerskov, a half-brother of his father. He taught at this school, was a very talented literary scholar and is considered to have been a mentor for many great Danish writers from this period. Michael seems to have had a lot in common with his uncle in terms of his interest in literature but also in terms of personality. Christian Agerskov was a very competent teacher, very much loved by his students for his benevolent disposition and for the respect and kindness he showed them. Michael Agerskov matriculated in 1889 and then continued his academic studies in Danish, German and Latin and graduated in 1895. During the first years after his studies he taught at different schools in Copenhagen before being employed at the Marie Kruse School at Frederiksberg, a girls’ secondary school. Doubtlessly Agerskov did a very good job as a teacher for young girls in Copenhagen, considering his friendly personality and his profound knowledge of literature and languages! This was a fountain of knowledge on which he was able to draw when he, in cooperation with Erling Rørdam, wrote a textbook, covering all levels from primary, secondary and up to the tertiary level. His textbooks were also re-arranged for a Swedish public by Tage Nørregård, and in Denmark as well as in Sweden they were used for several decades in teaching; e.g. the Swedish edition was reprinted as late as in 1959. 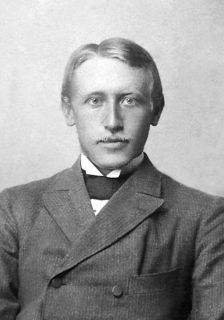 Agerskov also published two literature textbooks about his special field: early and modern Danish literature, targeting the tertiary education level. The parents of Michael Agerskov, Henrik Michael and Andrea Louise Agerskov photographed just before the turn of the century. Photo: Private. To the left an old map of Nykøbing Sjælland, and to the right a drawing of the customs house in the harbor of Nykøbing, where Michael Agerskov’s father was a customs inspector. 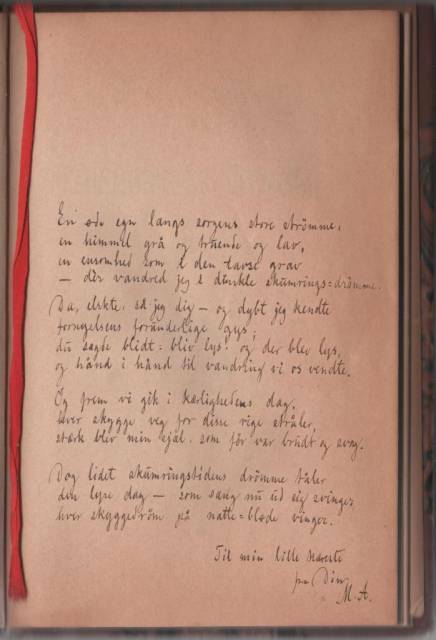 Handwritten poem by Michael Agerskov, dated 9/8 1918. The title is: “God’s Kindness. A Psalm.” Copyright: Private. 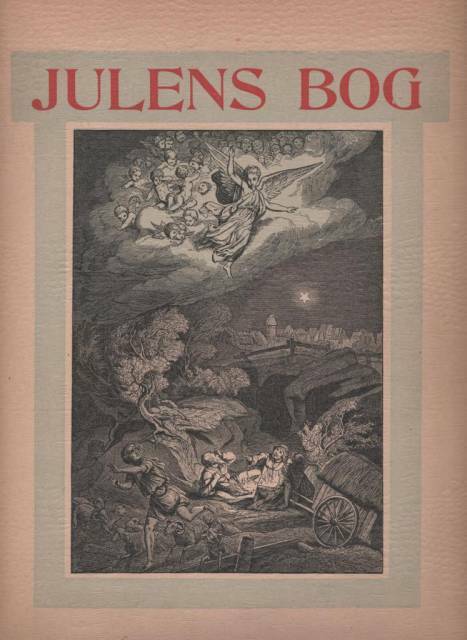 The front page of “The Book of Christmas”, which Michael Agerskov re-created from the German original, and published in 1899. 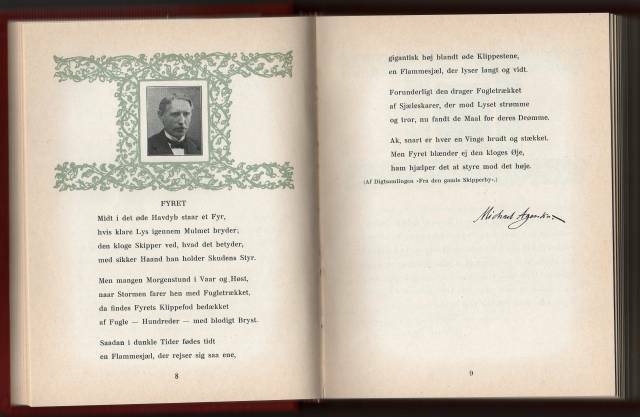 This is how Michael Agerskov was presented in the 25 year anniversary volume of the Danish Society of Authors, published in 1919. 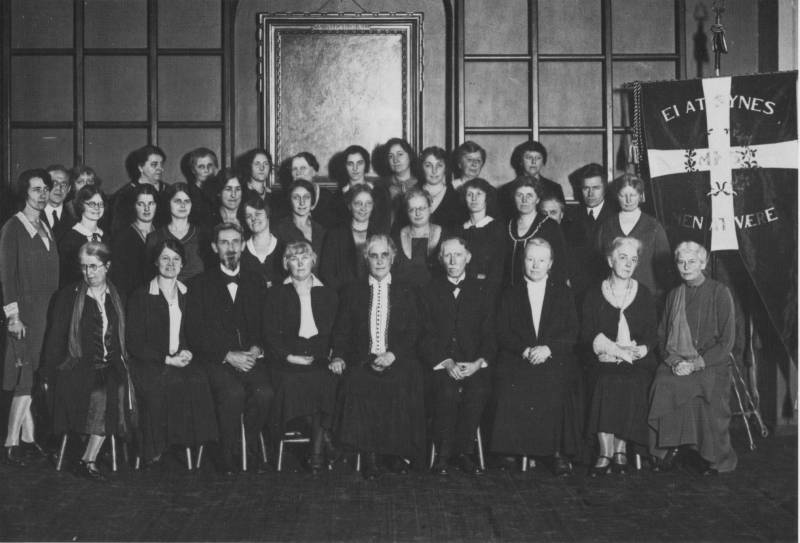 Michael Agerskov photographed together with the other staff members of the Marie Kruse School on the occasion of some kind of jubilee celebration, probably in 1930. At this point in time Agerskov is clearly marked by the disease that ended his life in 1933. 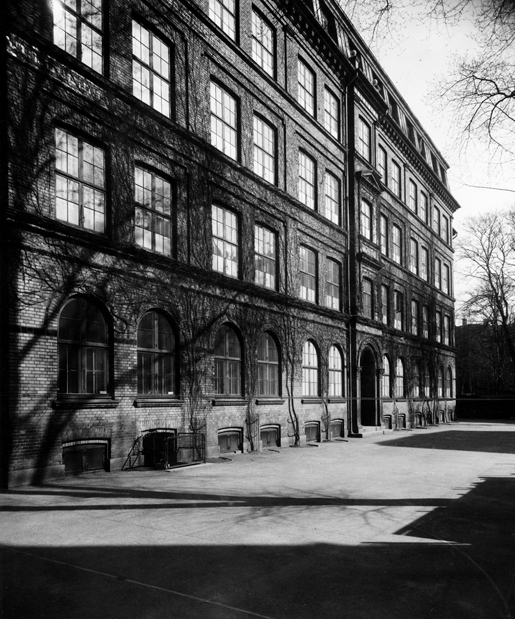 At the Marie Kruse School in Frederiksberg Allé no 16 Michael Agerskov worked for practically the entire duration of his professional career. Photo: The Royal Library. And here at Grundtvigsvej no 3,in a second floor apartment he lived with his wife and their daughter Inger Johanne Agerskov, 1900-1968. Photo: Sverre Avnskog. This is, so far, the last picture we know of Michael Agerskov, taken in 1931 in the gardens of the horticultural society. At Agerskov’s side is his daughter, Inger Johanne, who also became an ardent follower of Toward the Light! Behind the two are Agerskov’s sister Anna together with her mentally retarded son. Photo: Private. The Assistents of the Light on Earth! According to descendants in the Agerskov family, Johanne and Michael were so called freethinkers and hence did not belong to any particular congregation or denomination, even if they of course had been raised as Christians. Johanne’s father, Rasmus Malling-Hansen was a vicar at the Royal Institute for the Deaf-Mute in Copenhagen and a very strong believer, and Christianity was probably a dominating factor in her childhood and youth. Also in Michael’s family background there were many priests, in addition to his maternal uncle who was a vicar in Broager. Michael also published a book with Christian content: “The Book of Christmas” in 1899, a new version of an unusually beautifully illustrated German book about the birth of Christ by W. and H. Steinhausen. It is likely that both of the Agerskovs had in their mind an astral family heritage, providing them an intuitive understanding of and a natural interest in religious issues. This, together with the great insight of their spiritual personalities into the extrasensory truths, has undoubtedly made them very well suited when the spiritual world needed earthly assistants who could help them to convey some of the hidden truths about the origin of man and about our relationship with God to the human world. In their capacity as discarnated, both Mr and Mrs Agerskov belonged to a group of the Youngest who at an early stage had undertaken to participate in the mission to cleanse the teaching of Christ from false additions, and they had also shown in their previous incarnations that they had a particularly strong ability to follow the thought impulses of their conscience. Both the Agerskovs had mediumistic abilities, but Michael Agerskov’s task became first and foremost to stand by his wife’s side as a safe “ground tackle”, and he had, before his incarnation, promised that if Johanne succeeded in remembering her promise to work as a medium for Christ and his helpers, then he would stand as the publisher of all the texts produced through her work as a medium. And the couple carried out the task they had taken upon themselves with a unique patience and perseverance, and thanks to their loyal confidence in their conscience as well as their profound conviction about the great importance of their task, Ardor was released from Darkness through their loving prayer and with him also all the earthbound spirits who had filled the sphere of hell and the earthly plane, and God was then able to erase “the destroyed realm”. Both Michael and Johanne Agerskov dedicated their lives to carrying out their mission, and in addition to the time they spent as the assistants of the Light on earth, Michael worked full time as a lecturer and as an external examiner at the teacher education in Denmark. Hence, it became a natural thing that Johanne was the one to respond to most of the questions and comments from readers of Toward the Light!, even if Michael also contributed whenever his wife was incapacitated by illness or similar. Unfortunately Toward the Light and adjacent texts were not met with particularly good understanding neither from the church or by the literary milieu in Denmark. 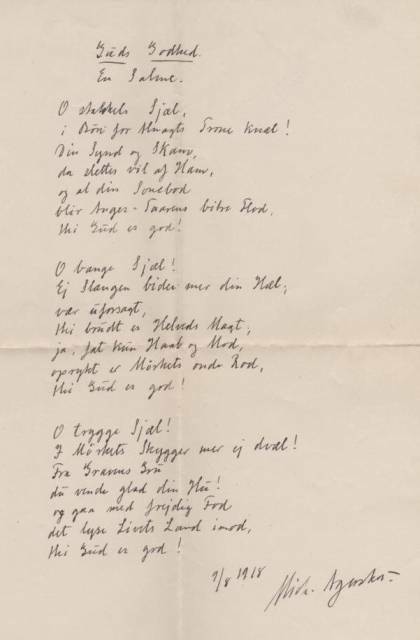 Agerskov even experienced that he was accused by a few people of being the originator of the poems published in the volume entitled: “Greeting to Denmark” in 1915, while in reality they had been authored by some of the great “deceased” Danish poets from the “Golden Age” in accordance with God’s wish and received through the medium of Johannes as a proof of the existence of life after death. Possibly the lukewarm reaction against Toward the Light! with adjacent texts is a contributing factor why Michael Agerskov’s own works were so quickly forgotten, and the few reviewers writing about Michael Agerskov’s publications referred to them in rather condescending phrases, while simultaneously it frequently became apparent that they had not at all bothered to learn properly about that which they commented upon. However, Johanne and Michael Agerskov continued undauntedly to talk about Toward the Light whenever they had a chance, and around them little by little a circle of supporters was formed, and their home was always open to those who wished to come and ask questions about the text, and also some of the nieces and nephews stayed in their home for shorter or longer periods while studying in Copenhagen. Comparing the two people, Johanne was by nature shy and reserved, while Michael was friendliness personified and very extrovert! Johanne Agerskov felt that the sunlight disturbed her mediumistic abilities and mostly kept herself indoors, and in the daughter’s – Inger Johanne – photo album left behind there are only two photos of her mother, whereas there are around 30 of her father. Johanne renounced practically all social gatherings and entertainment and only very rarely accompanied her husband on travels and excursions. On the other hand, Inger was very fond of and tight with her father, and her photo album has many pictures of the two traveling in Denmark, Sweden and Germany/Austria. Inger Agerskov was trained as a teacher of German, so it was quite natural that she accompanied her father on travels and vacations there. When the architect Knud Brønnum took an interest in their publications and embarked upon a lecture tour in 1925 and also published several books about TtL, and when the “Society for the Dissemination of TtL” was formed in 1926, TtL acquired a steady group of supporters numbering aorund 150 persons. Brønnum also frequently arranged divine services on the basis of the text, and Erik Prior, a strong supporter of TtL, later referred to the period from the mid 1920s and until sometimes in the 1930s as the golden age of TtL! However, unfortunately, the work never found favor among the men of cloth and also not among the majority of ordinary Danish people, and regrettably Michael Agerskov did not live to see very many of these relatively good years for TtL. He fell ill in a serious case of the Spanish flue in 1928, and as an after-effect he was hit by increasingly deteriorating muscular paresis which eventually also paralyzed his heart muscle. He had to resign from his job as a lecturer at the Marie Kruse School in 1931 because of the disease, and during the final years of his life he was a patient cared for at home and towards the end was not able to walk across the living room floor on his own. He died in 1933, and his sufferings were such, that he was also happy to go home to his creator, aware that he had carried out his promised mission on earth to the complete satisfaction of God. Up until now his accomplishments are not known by more than a few people, but in heaven it is well-known that Johanne and Michael Agerskov’s never faltering effort for the sake of goodness led to the final victory of the Light over Darkness in the spiritual world! And for this we owe them our heartfelt gratitude! Michael’s wife, Johanne Agerskov, lived up until 1946, while the daughter Inger died unmarried and without offspring in 1968.